Peterborough Panthers, from the left, owner Ged Rathbone, Scott Nicholls, Michael Palm Toft, Ulrich Ostergaard, Bradley Wilson-Dean, reserve Ellis Perks and team manager Carl Johnson, celebrate their Fours success. Picture: COLIN POOLE. Peterborough Panthers produced a stunning defence of their SGB Championship crown yesterday (July 1). The city side retained the trophy after seeing off the leading riders from their second-tier rivals in the annual event held at Redcar for the first time. Michael Palm Toft top scored for Panthers in the Fours Final. Panthers triumphed on their own shale at the East of England Arena – the traditional stage of the Fours - last year but their latest success provided a home triumph for Middlesbrough-based owner Ged Rathbone. They beat Scottish sides Edinburgh and Glasgow, and closest league challengers Lakeside in the four-team final after previously topping the standings at the qualifying stage. Panthers piled up 22 points in the 12-race showpiece to finish three clear of Edinburgh. Glasgow were third on 17 after Chris Harris – a member of the successful city quartet last summer – suffered a mechanical breakdown when leading the final race. Lakeside brought up the rear on 14. Panthers only provided two of the dozen race-winners, but they also only suffered one last place (when Ulrich Ostergaard tumbled out of the second instalment) as their consistent scoring pushed them to the top of the pecking order. 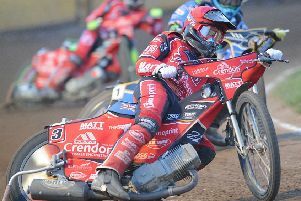 Michael Palm Toft led the way with seven points while Scott Nicholls reeled off three second places to contribute six points. Ostergaard – the only surviving member of the successful 2017 side – added five when recovering well from that spill and Bradley Wilson-Dean, who missed out due to injury last year, scored four. And Nicholls was in no doubt that it was a deserved success. He said: “Everyone is pulling in the right direction and that togetherness showed. “The spirit is so good and that gives you a desire to win races. I didn’t do that myself, but the whole performance was really strong and that got us over the line. Panthers played catch-up in the opening half of the final. They had to wait until heat six for Palm Toft to provide their first success before a second place from Ostergaard in the next race drew them level with leaders Glasgow. They took the lead for the first time when Nicholls added another solid second spot in heat eight before an Ostergaard success and a second place rom Palm Toft booted them four points clear. Wilson-Dean finished third in the penultimate race to leave Panthers three points clear of Glasgow with Nicholls needing to claim a point to be certain of success in the finale. And he was sitting in third spot when Glasgow man Harris suffered a broken chain while leading on the last lap with that retirement promoting Nicholls into second. Every rider had earlier taken two outings in the qualifying stage with Panthers leading the way from Edinburgh by a point. Palm Toft and Wilson-Dean were triumphant in both of their rides while Ostergaard recovered from a last place in his opening outing to win his second appearance. Nicholls collected three points from his rides courtesy of second and third places to give the city men 18 overall. The Fours success could be the first of four pieces of silverware for Panthers who sit four points clear in the league, have reached the SGB Championship Shield semi-finals and face a KO Cup quarter-final against Lakeside later this month. Panthers 18 - Michael Palm Toft 6, Bradley Wilson-Dean 6, Ulrich Ostergaard 3, Scott Nicholls 3. Edinburgh 17 – Erik Riss 6, Joel Andersson 4, Mark Riss 4, Josh Pickering (res) 2, Max Ruml 1. Glasgow 13 - Chris Harris 4, Lewis Kerr 4, Claus Vissing 3, Richie Worrall 2. Lakeside 13 – Nick Morris 6, Adam Ellis 5, Richard Lawson 1, Alfie Bowtell 1. Sheffield 13 – Todd Kurtz 5, Lasse Bjerre 5, Charles Wright 3, Broc Nicol 0. Workington 11 – Dan Bewley 4, Ty Proctor 4, Rasmus Jensen 3, Mason Campton 0. Berwick 11 – Aaron Summers 5, Jye Etheridge (res) 3, Nikolaj B Jakobsen 1, David Howe 1, Kevin Doolan 1. Redcar 10 – Thomas Jorgensen 3, Mikkel B Andersen 3, Ben Barker 2, Jonas B Andersen 2. Ipswich 10 – Nico Covatti 6, Rory Schlein 3, Cameron Heeps 1, Danyon Hume 0. Newcastle 9 – Tero Aarnio 3, Stuart Robson 2, Ashley Morris 2, Matej Kus 2. Scunthorpe 7 – Josh Auty 4, Gino Manzares 1, Coty Garcia 1, Jake Allen 1. Panthers 22 – Michael Palm Toft 7, Scott Nicholls 6, Ulrich Ostergaard 5, Bradley Wilson-Dean 4. Edinburgh 19 – Erik Riss 9, Joel Andersson 4, Josh Pickering (res) 4, Mark Riss 1, Max Ruml 1. Glasgow 17 – Chris Harris 5, Lewis Kerr 5, Claus Vissing 4, Richie Worrall 3. Lakeside 14 – Nick Morris 9, Adam Ellis 4, Richard Lawson 1, Alfie Bowtell 0.